Believe it or not this is a Catholic Church. 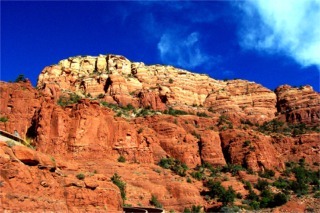 Sedona is known for it's Red Rocks and as you can see from these pictures rightfully so. It is quite a beautiful place. 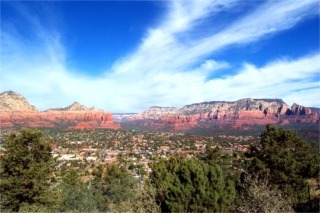 There are many parks and places to stop and view the scenery. These are the rocks behind the church. You can actually take a tour though the church. I wanted to get a picture of the stunning view you get sitting in the pews but the sun was at such an angle they wouldn't turn out. The parishioners have one heck of a gorgeous view. We like to stop at one of the state parks and have a picnic. This is the view from one of those sites. 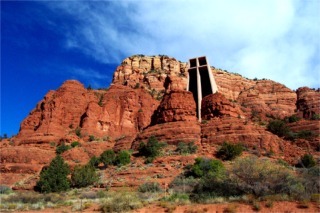 One of the problems with Sedona is they want to capitalize on these views. I don't blame them. But, each park you stop at has an admission fee and you can't buy an admission for all of them. Each one is separate. 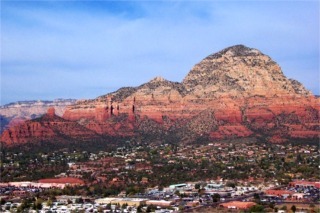 This is a view from the airport mesa. This view point had an honor system box where you put in a donation. This is the only one we saw like that. At the others they had people collecting the daily use fee to enter. Even if you just wanted to stop and take a picture it would be $5. 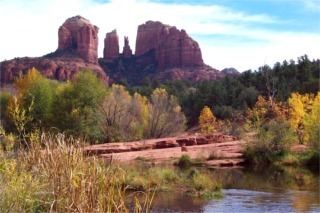 Located in the high southwestern desert under the rim of the Colorado Plateau at an elevation of 4,500 feet, Sedona is blessed with four mild seasons, plenty of sunshine and clean air.